We are here with a wonderful weekly inspo post to get you mind geared up and ready for the upcoming week. It is our life mission to get you inspired to SHOW UP for your health and happiness – because you are always worth it. Simple. As. That! On the most basic level, grass will only turn green when it has been watered by a source. We could leave the blog right here, because this quote in and of itself is SO powerful and stopped us in our tracks when we read it in the “Happiness Hack” book, but we love putting out our weekly blog and want to expand more on this topic in hopes it may change the way you view your own health as a priority. The simple approach in life is to keep thinking that the grass is greener on the other side, or for someone else. That it’s just not in the cards for you right now because of XYZ, and that your neighbor’s grass (a friend, co-worker, someone you follow on FB) is greener because they are “lucky” and had all the right cards handed to them! WRONG! I can tell you with 100% certainty that no one achieved success at ANYTHING by luck or circumstance. And by success, we aren’t measuring that by the amount of 0’s behind your bank account balance. We measure success based on how you are currently thriving at your life. How you feel in your own skin, the energy you have to tackle your days, the excitement you have for knowing adventures are possible for you to still experience. You achieve greatness by watering YOUR OWN grass first. Greatness comes from taking care of your lawn, aka, your mental and physical well being, so that you have a solid foundation from which to give to everything else that matters in your world. And much like real grass, watering your own grass will probably come with some help from the outside world. // Help from aligning yourself up with a solid support system of like minded people. Don’t buy this one? Try hanging out with a bunch of negative nellie’s for a few hours. Then go spend a few hours with some motivated and positive friends. Which group do you leave feeling happier and more optimistic from? You are who you are surrounded by, pick wisely who you allow to control your energy. // Help from setting yourself up with tools and accountability measures to keep you on track with your goals. Do you have goals, but no plan? We call that wishing, not goal planning. Every goal needs a solid plan, a backup plan, and accountability measures set in place. Because the real work always starts when the mood you set the goals in leaves and reality sets in. // Help from having the right people around you that will help pick you up and cheer you on when you lack motivation or fall behind. We all have off days, week, months and sometimes years! Surrounding yourself with a tribe that truly cares about your well being is crucial. Those are the best connections you can make. Being able to be vulnerable and ask for extra help (water for your grass), when you don’t have enough energy to muster it yourself. But it all starts with the premise that self care is not selfish, that in fact self care is critical care. Without care and nurturing, your own lawn will turn brown and die off. With an under-watered lawn, you’ll lack motivation to do things you once loved, you’ll negatively talk to yourself all day, you’ll let the enemy of comparison rob you of joy, and you’ll slowly and steadily find yourself losing more and more joy in life. You get this one life to live, so set yourself up to truly LIVE it! To enjoy it! To be present! To chase dreams and push limits! 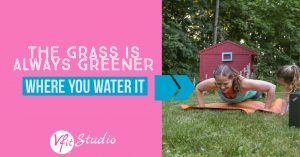 Some great ways to water your own grass on a daily basis are: by drinking enough water each day to optimally function, fueling yourself with nourishing food, sleeping, getting fresh air, being grateful, taking time to pamper yourself, and of course getting in workouts that push, challenge, and center you. The time you take for you each day for your self care pays you back in so many ways! It’s ALWAYS worth it to take time out of your day – for you. You’ll never regret a workout. Even if you aren’t feeling it, just telling yourself you’ll give it 5 minutes is a start. 99% of the time even keep going after that! And that 1% when you don’t? Heck, 5 minutes is always greater than zero minutes. We’ve checked our math on that and it’s right!! So if you catch yourself wishing the grass was greener with your health, take a moment and think about what areas you can improve on today and just START. It can be as simple as drinking an extra cup of water today, or taking that 5 minute movement challenge and working out for 5 minutes today. The important thing is to start, and to not hold back or push it off to another day. Do yourself the favor and start right now. Wishing only gets you so far. Real change only happens when you take action and that’s where the VFit team excels the most. Sometimes it’s a matter of not overthinking things and just putting one foot in front of the other and doing SOMETHING! Doing something is water for your grass! And soon that grass will beg for more and more water because it feels so good! And how can you deny yourself the greenest grass on the block! ?